Conference in Washington DC on Tribal Sovereignty, Legal Trends & Directions. 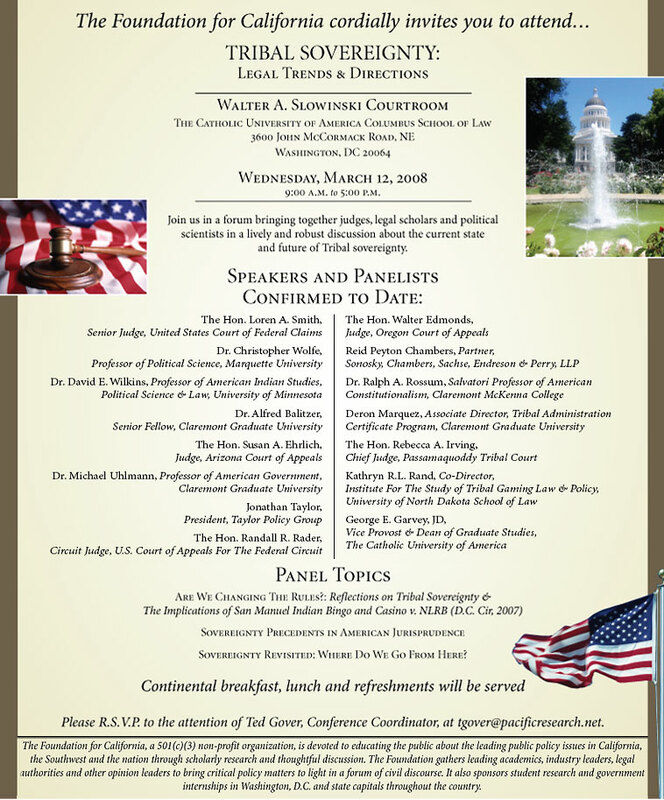 March 2008, the Foundation sponsored and hosted a conference in Washington DC on Tribal Sovereignty, Legal Trends & Directions. The Hon. Rebecca Irving, Chief Judge, Passamaquoddy Tribal CourtThe Hon. Sovereignty Revisited: Where Do We Go From Here? Jonathan Taylor, President, Taylor Policy Group, Inc.
From May 12-15, 2011, the Foundation For California coordinated an educational visit to the Holy Land, hosting a delegation from the Association of Southeast Asian Nations (ASEAN). This trip was part of a larger project of the Foundation of bringing leaders of different faiths to the Holy Land to conduct important dialogues and reach out across boundaries that divide people. Past Foundation For California delegations to Israel have included key leaders from the civic, political and religious communities of Indonesia, India and Japan. Highlights of the trip included meeting with local political and government leaders, an academic address at Hebrew University, meetings with religious leaders and visits to sites of Jewish history and culture. Guests were hosted by President Shimon Peres at the President’s official residence. While the specifics of their conversation remain off the record, issues relating to building trust and relationships between the Muslim and Jewish worlds were discussed. Additionally, throughout the stay in Israel, the group was received by a number of officials from the Foreign Ministry, the Prime Minister’s Office and other entities of the Israeli government. A well-received address at Hebrew University entitled “ASEAN, China and America: The Future of Southeast Asia” was given at the University. Attending were students, faculty, university staff and interested members of the community. The talk addressed ASEAN’s efforts to engage the United States, the rising powers of China and India in addition to broadening outreach to the Middle East. Meetings with various religious leaders were arranged during the visit, the highlight of which was a Shabbat stay with a noted Israeli Rabbi where the delegation were treated to a night of excellent food, singing, prayers and fellowship. Prior to the trip, the group expressed a desire to learn about Jewish religious practices and the Jewish people. The FFC trip organizers delivered on this front by taking the delegation to sites of Jewish history and culture, namely, the Mount of Olives, the Old City of David, the Wailing Wall, the Kotel Tunnels, southern excavation sites in the Old City, Yad Vashem and Ein Gedi, among other locations. “The Courage to Remember” traveling Holocaust exhibit made its debut in Sacramento, Calif. and was viewed more than 30,000 people in 8 locations in 2011. Interest in the 2011 tour was notable, including coverage by the LA Daily News, Sacramento Examiner, Capitol Public Radio and numerous other outlets. Emboldened by that early success, the exhibit was requested in Florida and made its Southeast debut at Tallahassee Community College on January 16, 2012. In 2012, the Foundation added 32 new venues to the schedule and ramped up its efforts to invite and promote VIP attendees to the media, as well as to promote the exhibit in conjunction with presentations by local authors, historians and professors. Both media coverage and attendance for the exhibit exploded in 2012. An event in Modesto garnered 500-plus people and coverage from major media outlets. Events in Broward County and Santa Ana garnered 300 attendees, with students Tweeting their experience. Attendees that year included members of Congress, mayors, city councilmembers, top officials from the Red Cross, leaders in education and veterans affairs, law enforcement members, multiple liberators and survivors, authors, Holocaust historians, students, and families. At the end of 2012, the exhibit had been viewed by more than 800,000 people. As of early 2013, 35 venues are already scheduled, including San Diego, Miami, Jacksonville, Boca Raton, India and Thailand. The Foundation for California continues to receive weekly letters and social media messages from individuals from past tour stops expressing their gratitude for the exhibit and requesting it return annually.